A beautiful, personalised ‘This amazing Grandma’ ceramic mug. 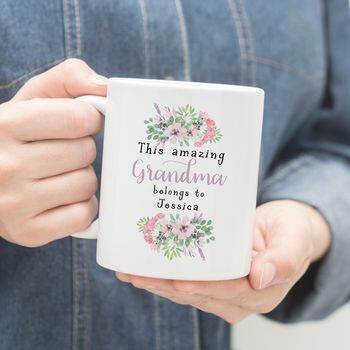 This gorgeous ‘This amazing Grandma belongs to’ mug makes the perfect gift for Mother’s Day, Birthdays and Christmas. The mug features watercolour flowers in shades of purple and is personalised with the name of your choice. This mug can be personalised with the name(s) of your choice.